Dr. Shapiro ensures that you will receive the latest in hair restoration technology with our affordable hair restoration pricing and expert care. Hair transplant costs don't have to limit your ability to get a permanent solution to your receding hairline. We also offer travel incentives for accommodations and transportation so that you can combine a vacation or business trip with your hair transplant. Call for pricing on FU, FUE and COMBO FU and FUE. 1-561-414-4509. With our interest free financing there is no better time to take control of your hair loss. Dr. Shapiro makes hair transplant prices affordable. We accept Visa, Mastercard, American Express, Discover, as well as cashier's checks. Personal checks are also accepted if provided to us a minimum of 2 weeks prior to surgery. he explained that I would get a lot more density with FUT. He as right. All prices include all follow-up visits, anesthesia, and the surgical facility. No taxes are involved, and blood work and post op medication are extra. We accept all major credit cards and cashiers checks. Prices are subject to change anytime unless your reservation is held with a deposit. Prices are good for this month only and new prices will be posted beginning of next month. Dr Shapiro will review them and give you a price. Our highly trained and experienced medical staff are ready to support you through your hair transplant - Florida! Special prices for Caribbean packages. For patients flying from Bahamas, Trinidad, Barabdos, Cayman Islands, Jamaica and it other Islands. We have more experience in African American and Islanders' hair transplantation than any one else. Call for special pricing. Dr Shapiro has developed special blades for African American and Islanders' hair types. It's not just the hair transplant cost. Getting hair transplant surgery can be an intimidating process if you don't know what to expect. We want you to be knowledgeable about the procedure, what to expect, how it works, and what you should know before you come in for hair transplant surgery. The process includes an initial free consultation which will allow you to meet personally with the doctor, see an actual hair surgery procedure, the hair transplant surgery itself, and then a comprehensive follow-up, both in the days immediately following your surgery, and some time later to access your progress. If hair transplant and restoration cost is an issue then we'd like to work with you to make your dream affordable! Call NOW for your FREE consultation and receive 100 FREE grafts!! Question: "Why do some clinics charge twice as much as Dr. Shapiro? Answer: "It has been Dr. Shapiro's mission for the past 20 years to make hair transplantation affordable for everyone. By keeping our overhead low (not using salesman or multiple doctors with less experience) and maintaining offices solely in South Florida we are able to offer not only the best price but the best results as well. BEWARE: Many times in other clinics you will meet with a salesman who will quote you a price of $8-10K (some are even as absurd as $15k) for a sitting. Since the price per graft is so high you will get fewer grafts and it may take as many as 5 sittings to achieve any density. (Thereby, a higher price of hair replacement and less hair as well as less donor area for the future). Ethically, Dr. Shapiro believes it is better for the patient to do fewer sittings with more grafts in each sitting. This will preserve donor area as well as additionally help with hair transplant cost." 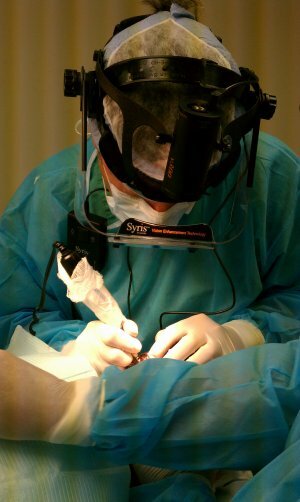 Right: Dr Shapiro performing a surgical hair transplant with the most advanced polarized high power Syris loupes for maximum accuracy. Question: "If another doctor charges twice as much will I get better results from them?" Answer: "Experience, both technical and artistic, are the most important factors to look for when considering a hair transplant. Because Dr. Shapiro is the founder and sole physician and has performed over 11,000 cases in the past 20 years, you are assured to receive the very best hair restoration possible in the industry. Dr. Shapiro feels that it is more ethical to make it affordable so that the patient is able to do a maximum number of grafts in each sitting (which not only saves money but will preserve the donor area for any future sittings that may be needed.) Many other clinics need to charge twice as much or more to make up for the lack of clients. In addition, they may encourage you to do a smaller sitting because the hair transplant cost is prohibitive otherwise. This will cause the patient to need additional sittings (with no regard to the valuable donor or hair transplant and replacement cost)." We offer Special European Packages including FUT, FUE & FUE/FUT combinations. Call for more information. and stayed in Orlando and drove down to Dr Shapiros office. It was the best experience of my life. We have many patients flying from Europe who want the most affordable price and the most advanced hair transplant techniques in the world. The patients fly into Orlando via Thomas Cook airlines and our hair transplant cost is so economical compared to the physicians in England they get a nice sunny holiday with it too. It is also as inexpensive as traveling to Poland or Czech Republic and you have the services of the most experienced hair transplant doctor with 22 years of quality work. Special prices for Brasilian packages. For patients flying from San Paulo and other cities in Brasil. Call for special pricing.